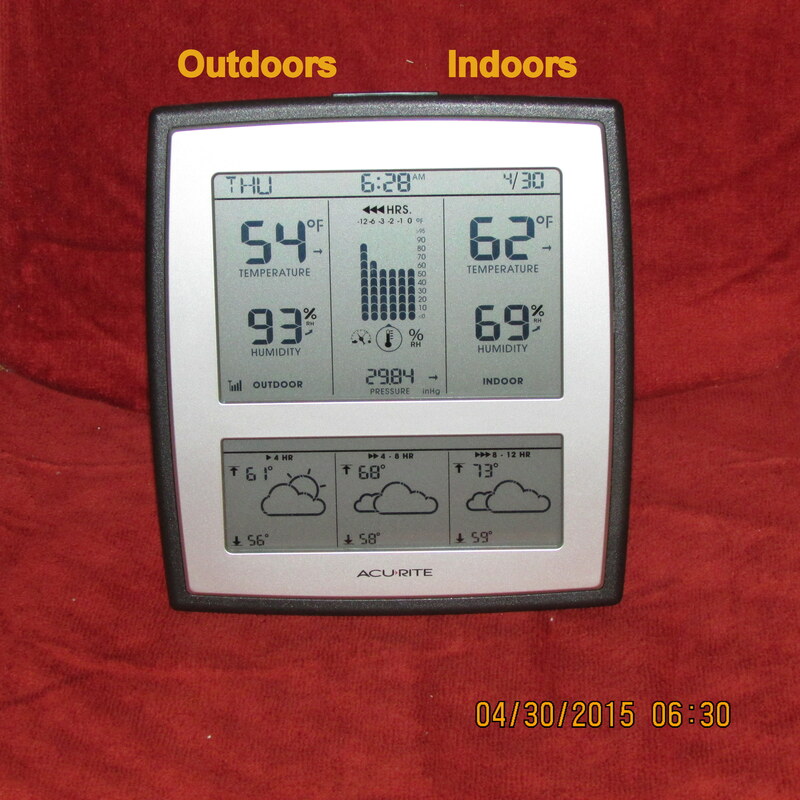 Another cool night; another morning where I activated the furnace. Nine o’clock: Now I’m heading to Lowe’s for organic planter soil. I’m overdue to plant lettuce, radish and green onion seeds. It’s been over three weeks since I shopped. First stop: Tractor Supply for bird and squirrel food. Second: Health Food Store. 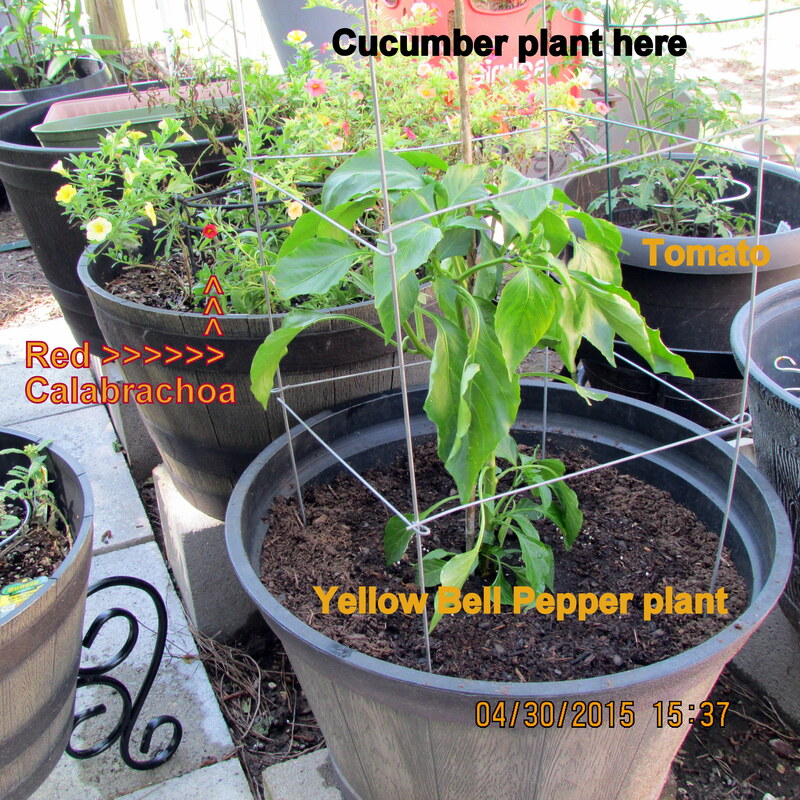 Third: Lowe’s for two bags organic, and one bag non-organic, planter soil, one Yellow Bell Pepper plant, one red Calibrachoa, one Marigold plant. Fourth: Groceries from a local market. 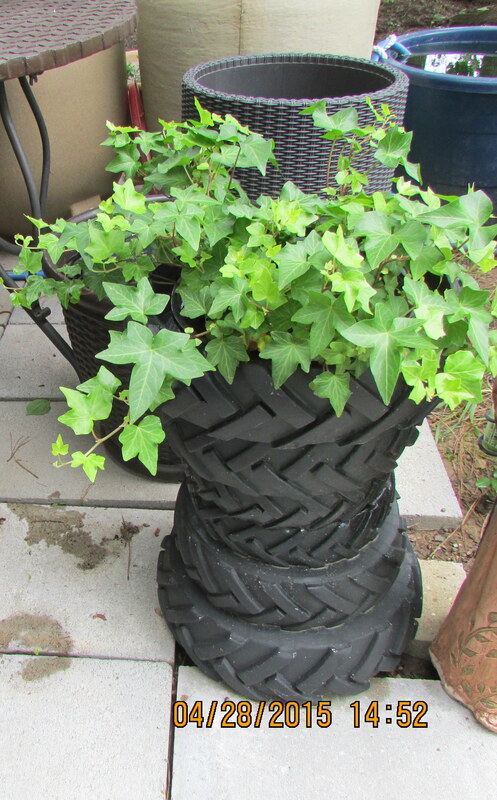 ~~ I planted as soon as I got home (before I put groceries away, lol). 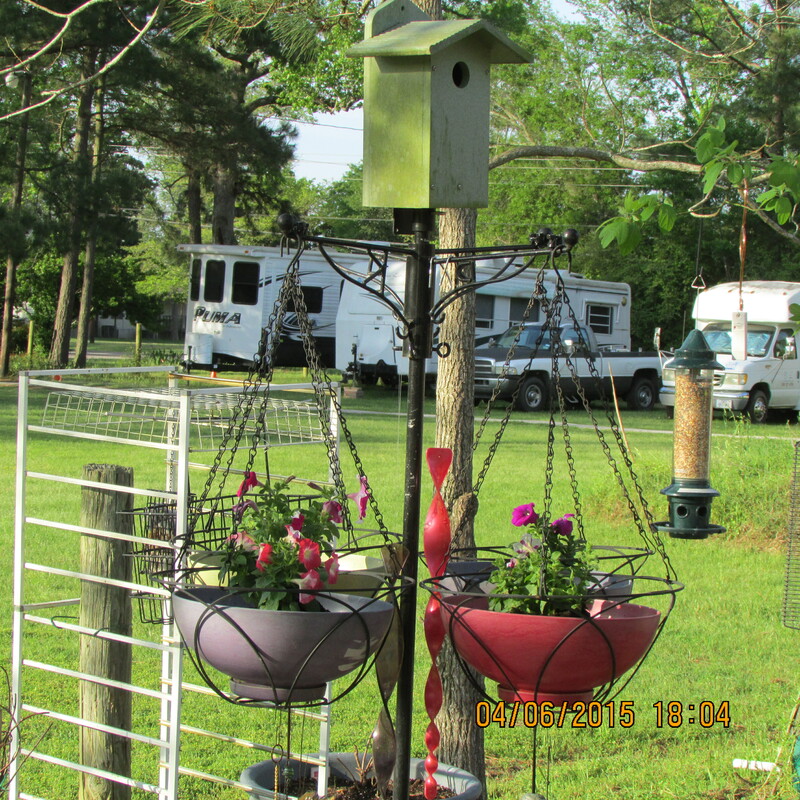 Well, I planted… after using the hand-truck to move the planter soil, and bird seed, from the car to their respective locations. 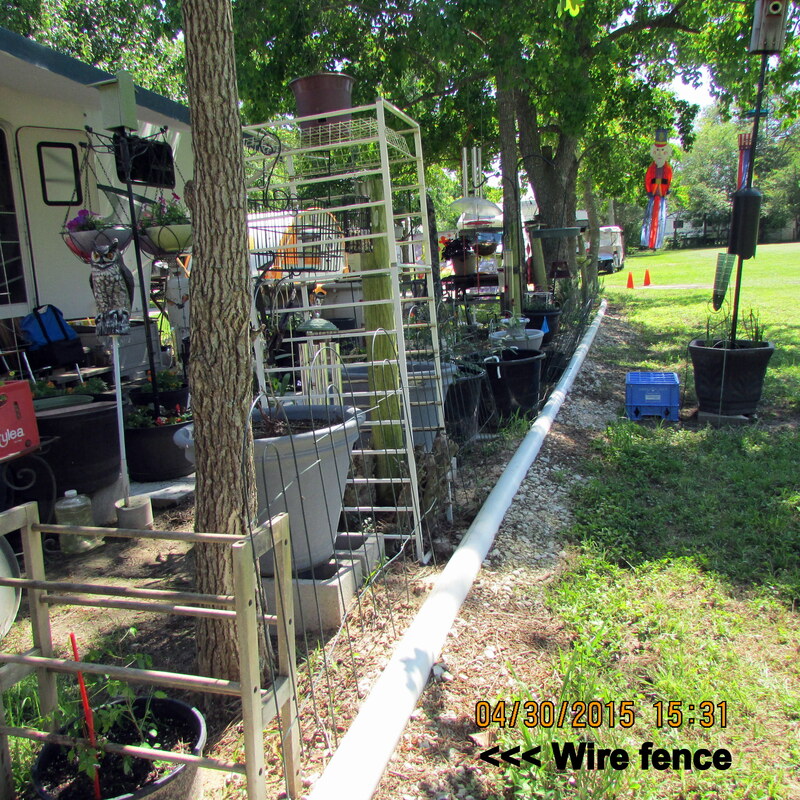 Then I started the process of setting up sections of a wire fence. 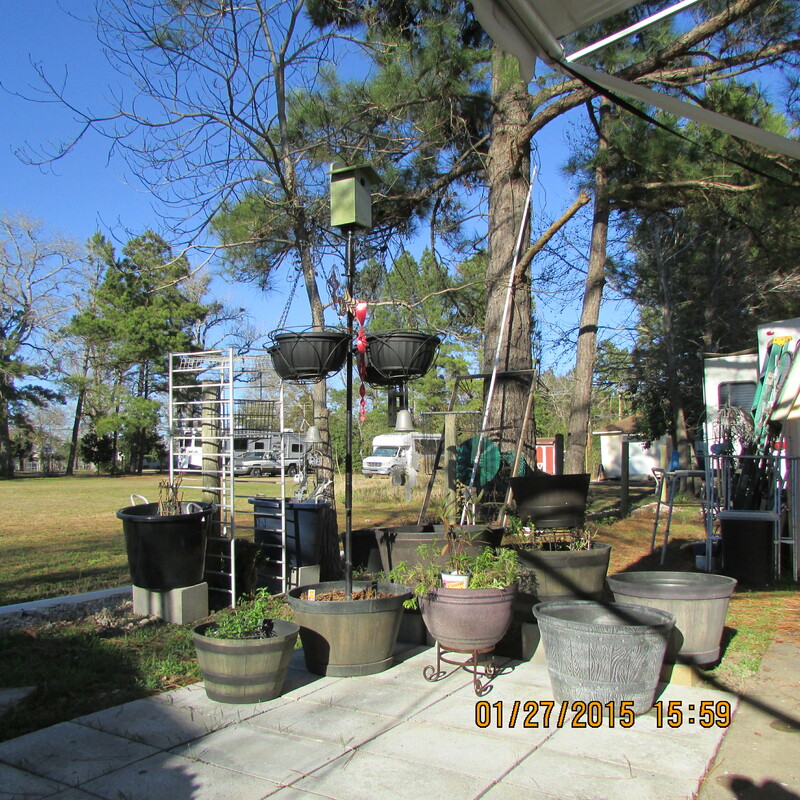 Yesterday, a departing resident (in the RV Park) gave me a lot of garden things. 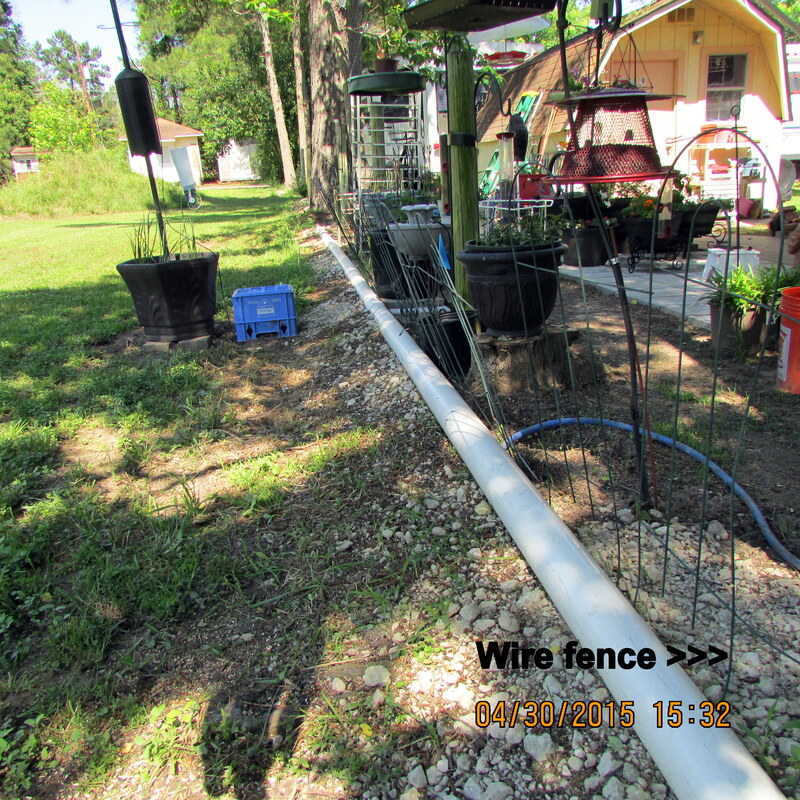 It will take energy to force the bottom of the wire fence into the rocks alongside the white pipe berm. 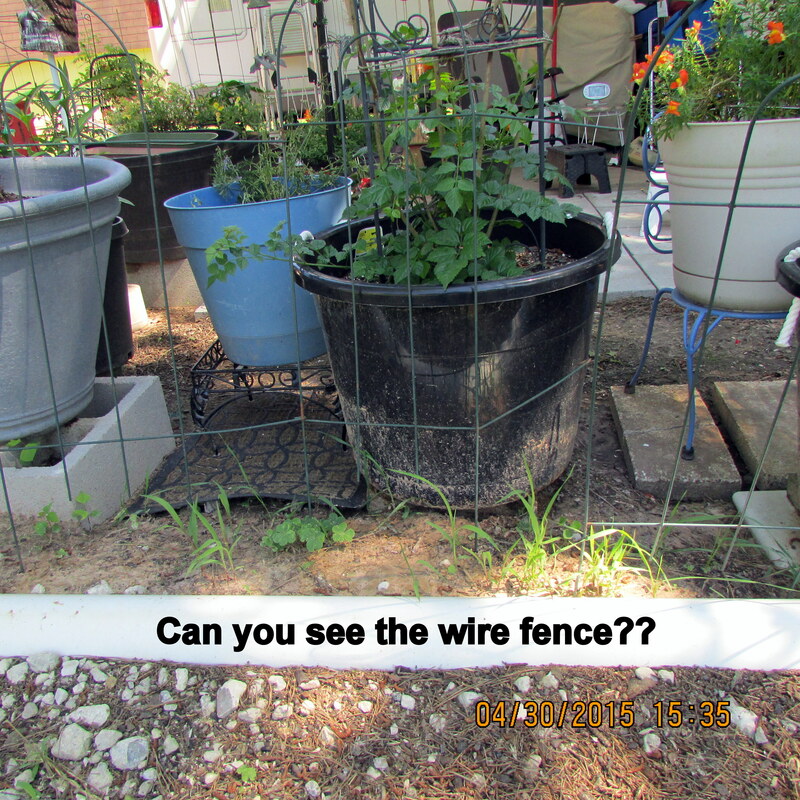 Some wire needs to be straightened. A good project for another day. 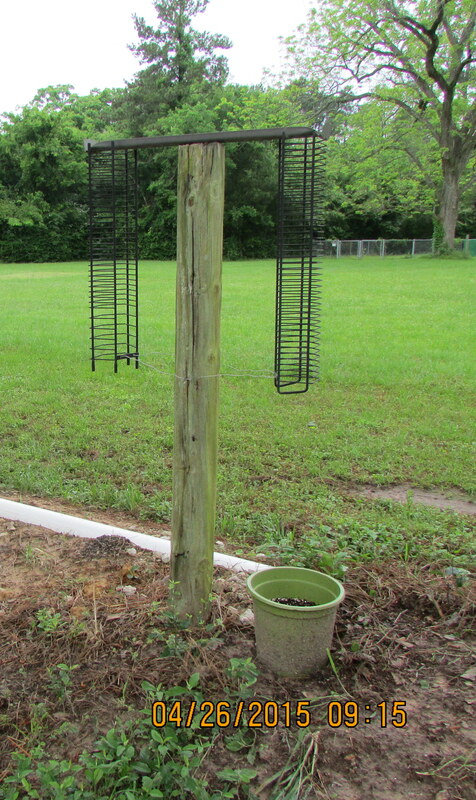 Then I must plant the long-neglected Periwinkle plants along the pipe. 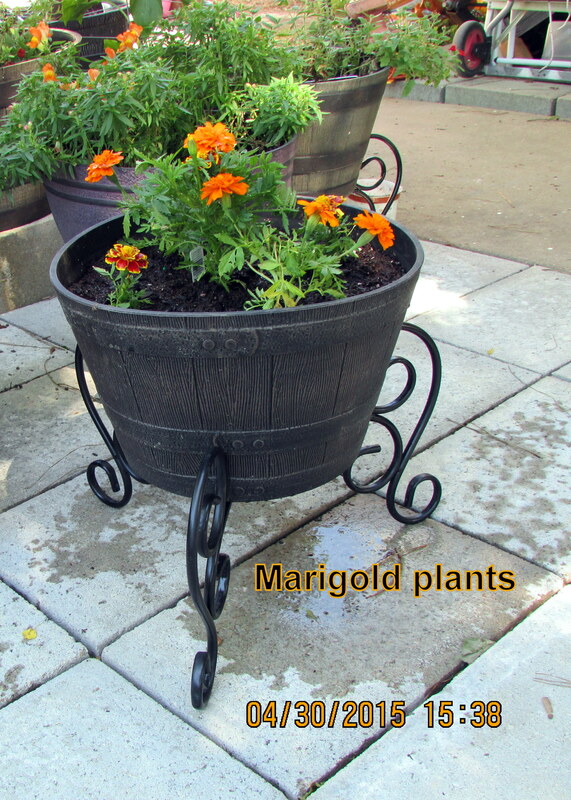 One new Marigold but four “old” plants that had been neglected because no planter soil. Feels like Winter!! (Abracadabra.) 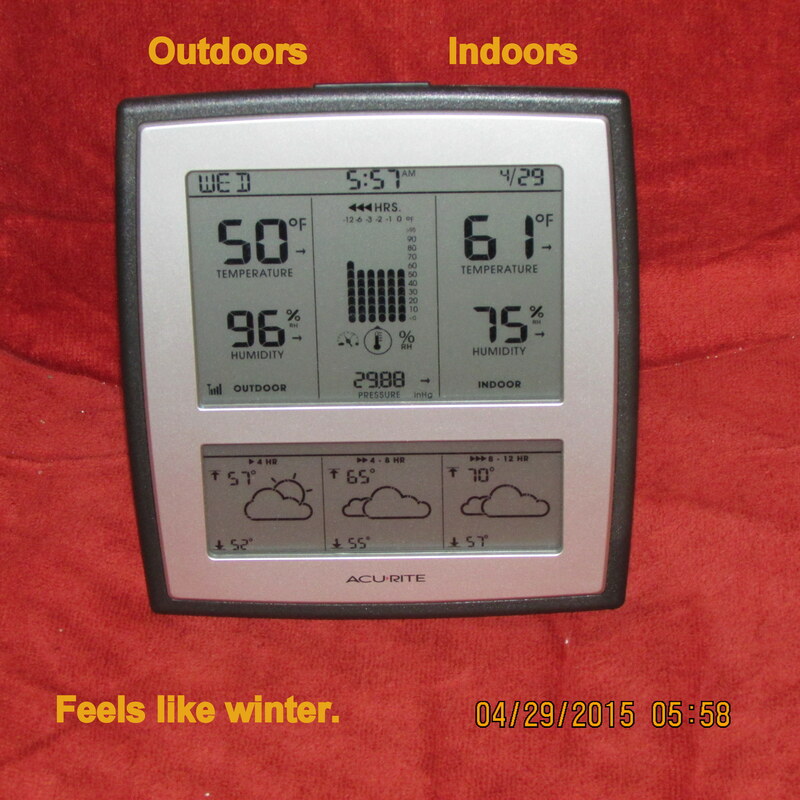 Yesterday, due to dip in temperature, I had to close my windows and door. I wanted to turn on the furnace but the recent power outage disabled furnace/air-conditioner. The tower oscillating heater was packed into storage several weeks ago (and I wasn’t going to struggle to get it). Instead, I clicked toggle switches in the breaker box; I changed batteries in the remote control. Finally, some heat!! 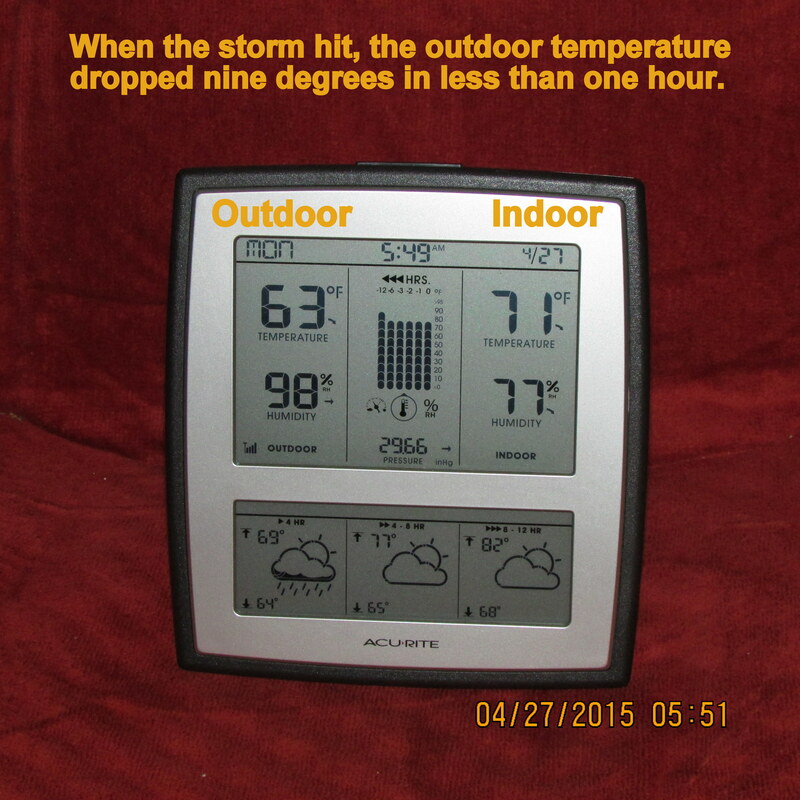 The temp was low during the night but quickly raised when I got up (to shower). A busy day ahead: I’m taking a professional CPR training class. 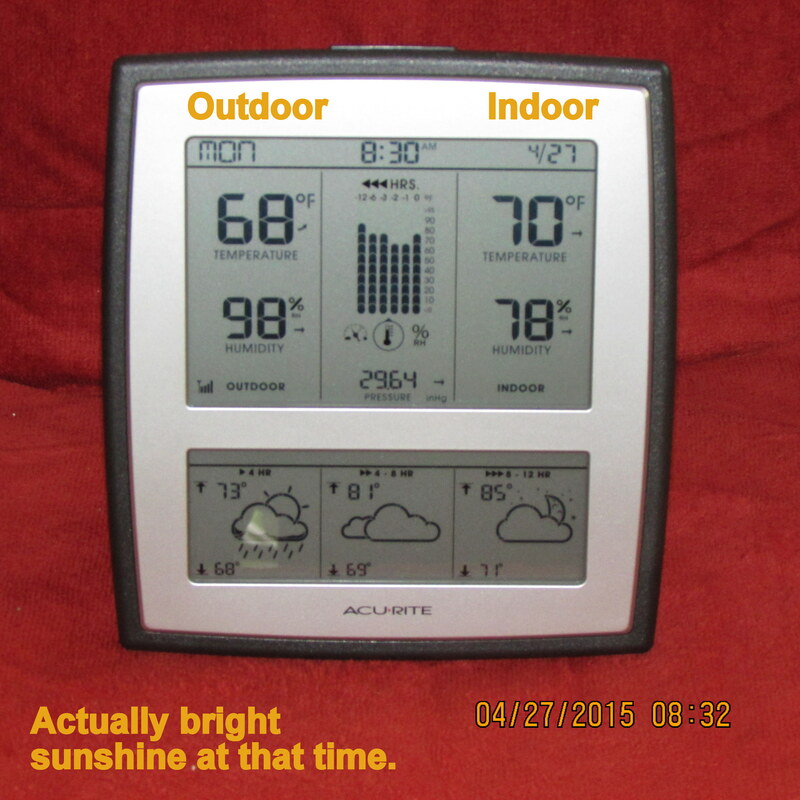 It would be another great day for indoor, or outdoor, tasks but I signed up, and paid, some weeks ago. Gotta go. 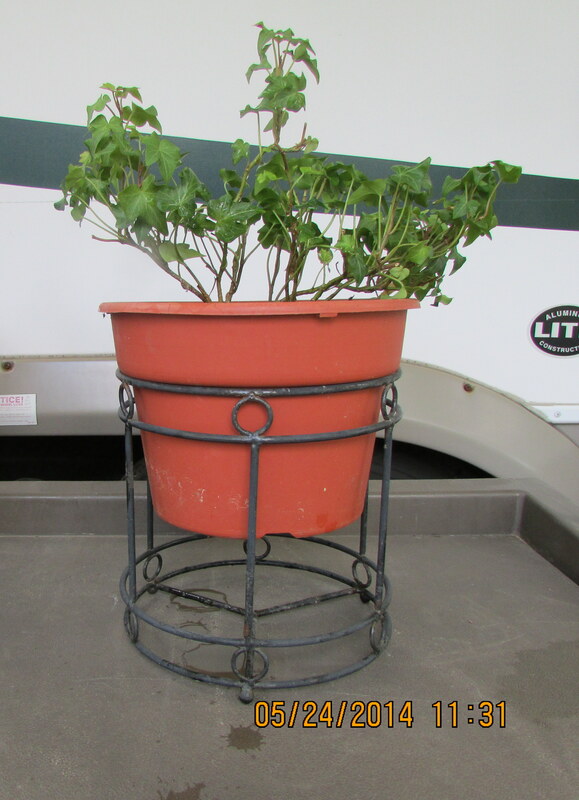 In the May 2014 blog message, I have a picture of “Ivy.” Here are before and after pictures. She seems very happy on my patio. April 28, 2014: Lucky Lady. April 27, 2014: Something old, something new. 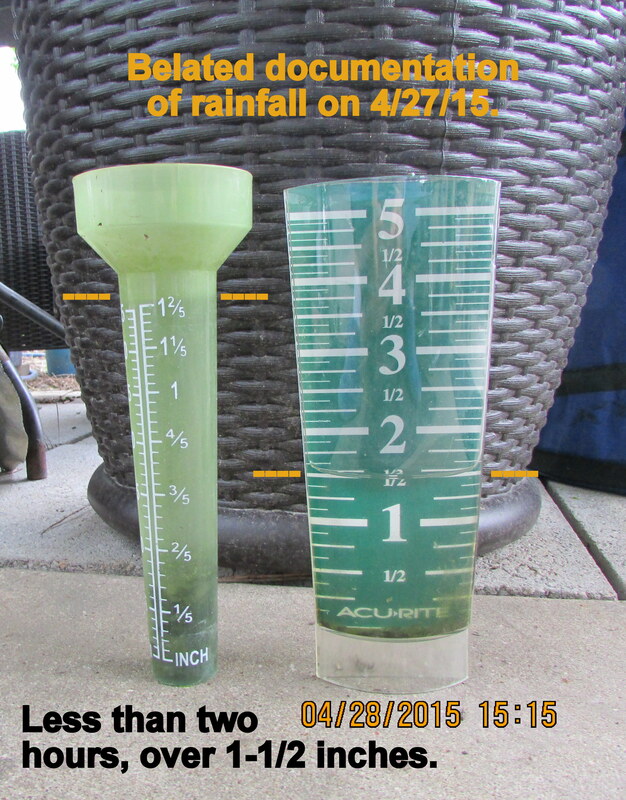 April 27, 2013: Rain on our rally. April 28, 2012: Three Quarters And Counting. April 30, 2012: En route to a T@B Rally. April 29, 2011: The Royal Wedding. I seriously lament that I am not planning a trip to the 2015 Blue Ridge Rally!! 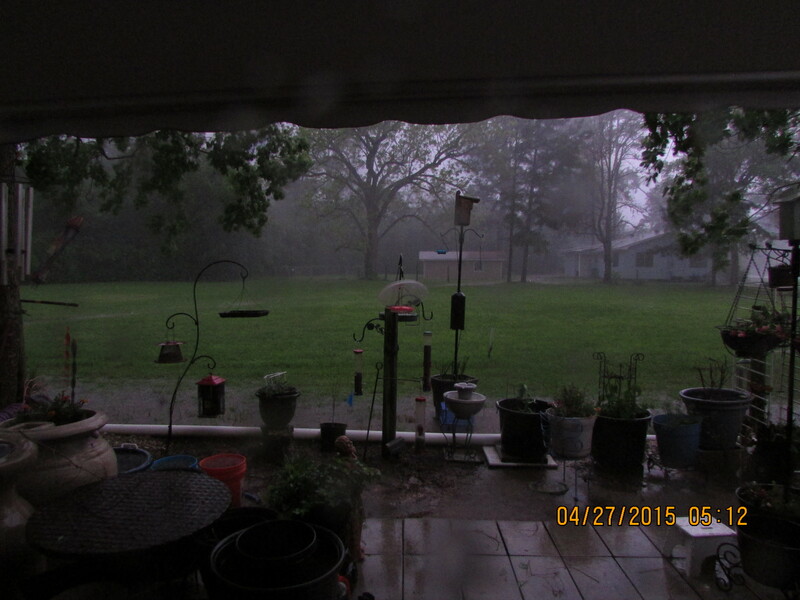 Awakened about 4:30 AM because I heard thunder in the distance. I got up and turned on the TV news. 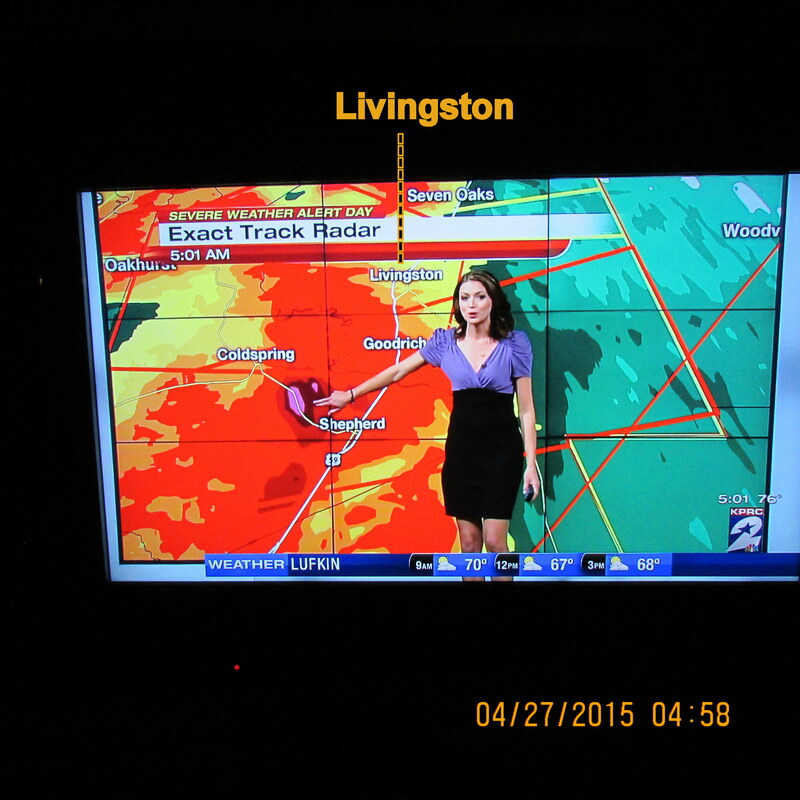 Yes, severe weather was headed our way. 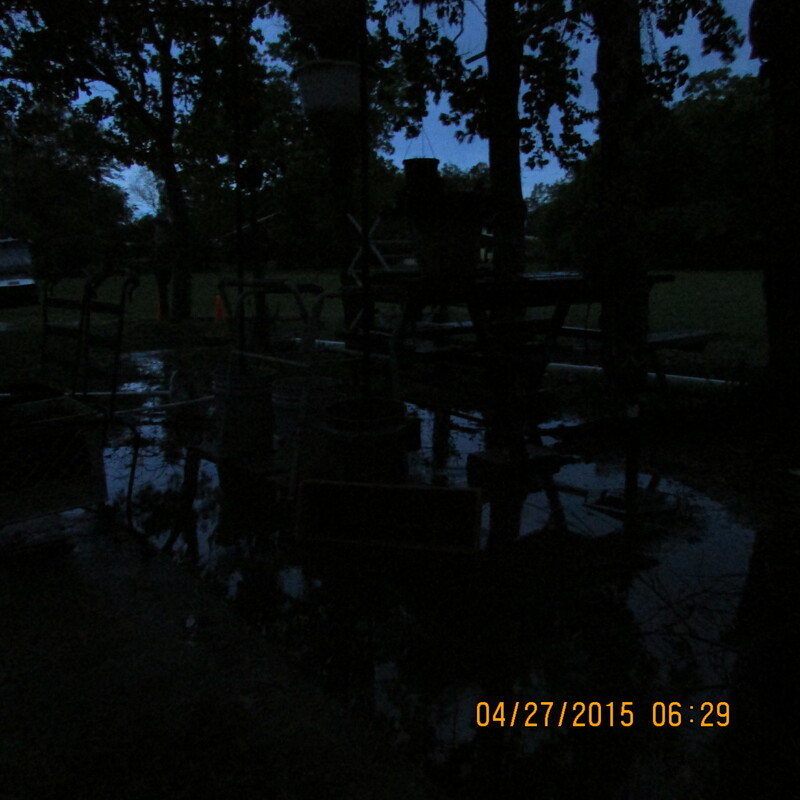 Shortly after that first picture, at 5:06 AM, the power went out. 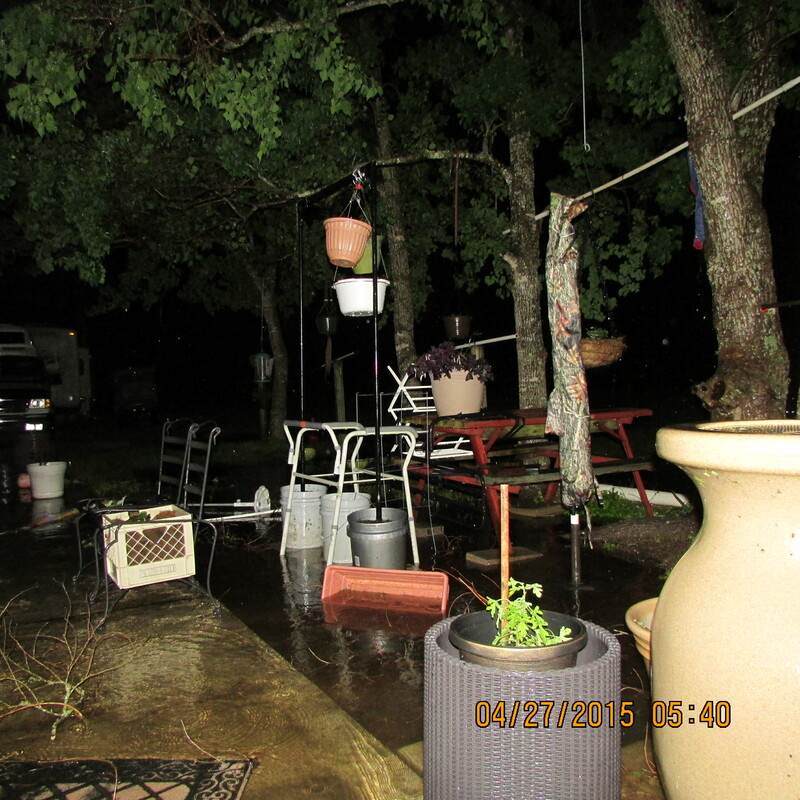 Picture number two is the only successful image attempting to capture a lightning strike. 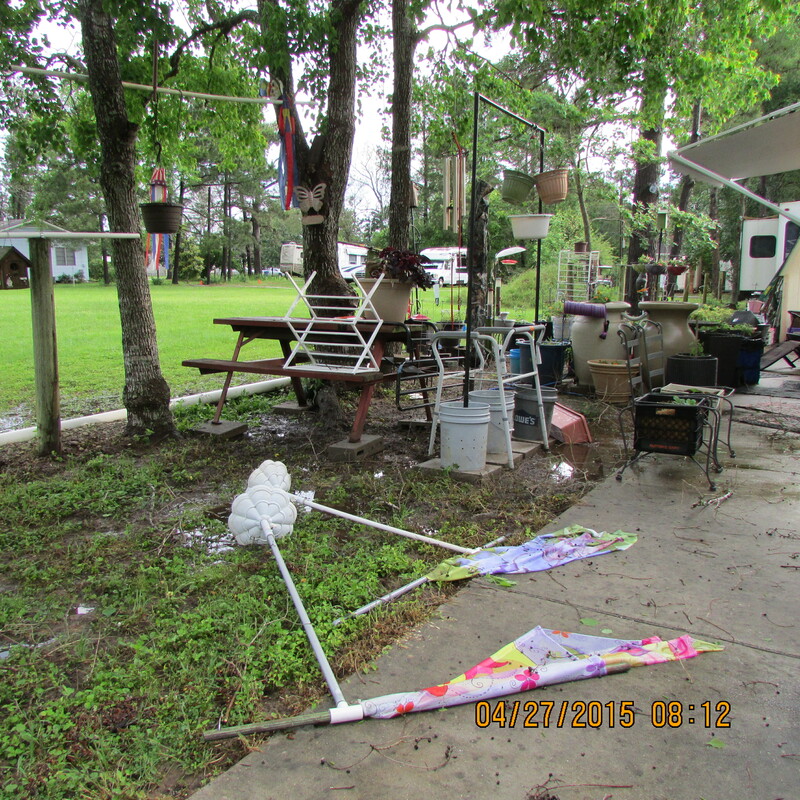 The wind was determined to rip the awning off my trailer. 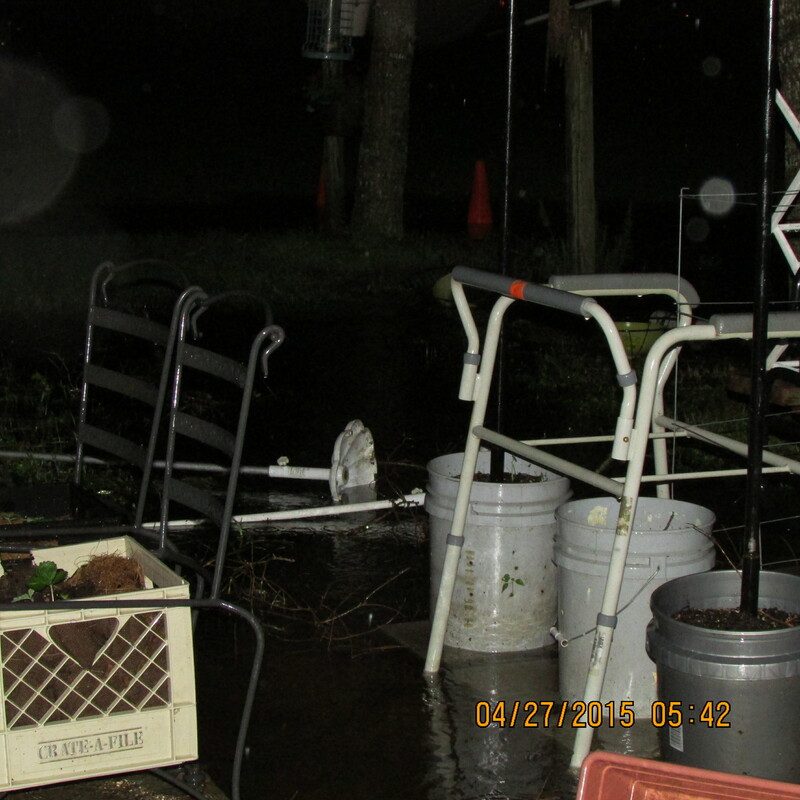 I located flash lights, quickly dressed, got out a rain coat, and put my purse with ID and medical cards at the door. 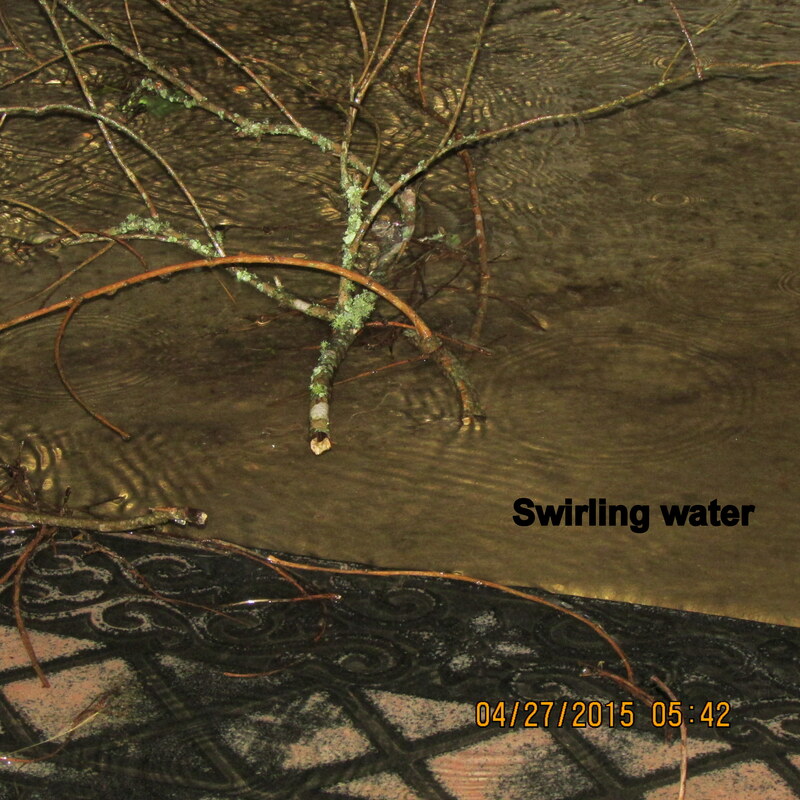 In almost pitch darkness–except for lightening–I watched and waited. 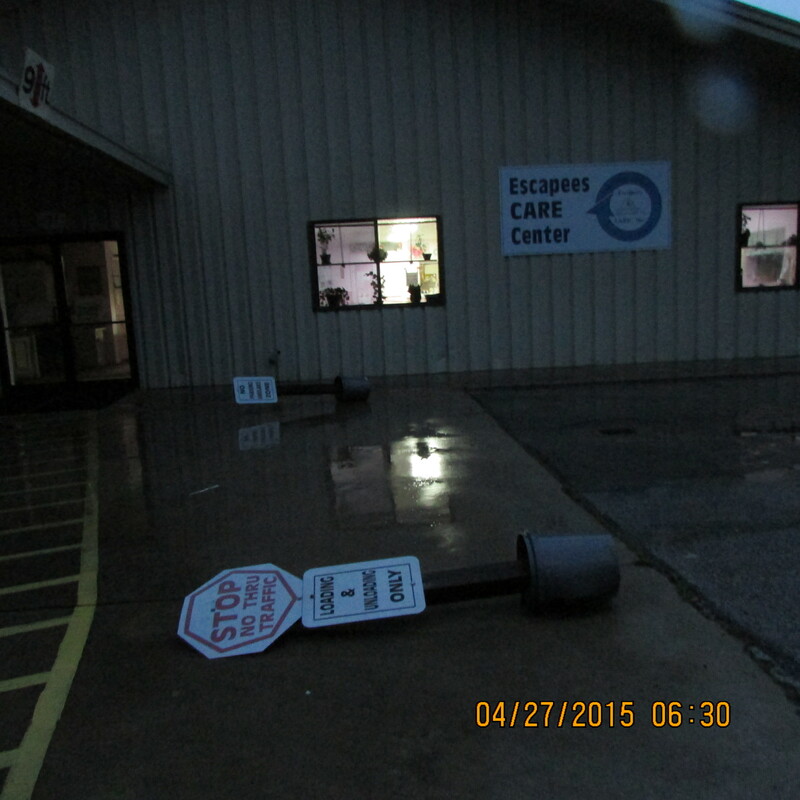 I wondered if the CARE Center was open–because it has a generator. At 6:30 I went to the Center and, indeed, staff and volunteers had been there since 4:30. 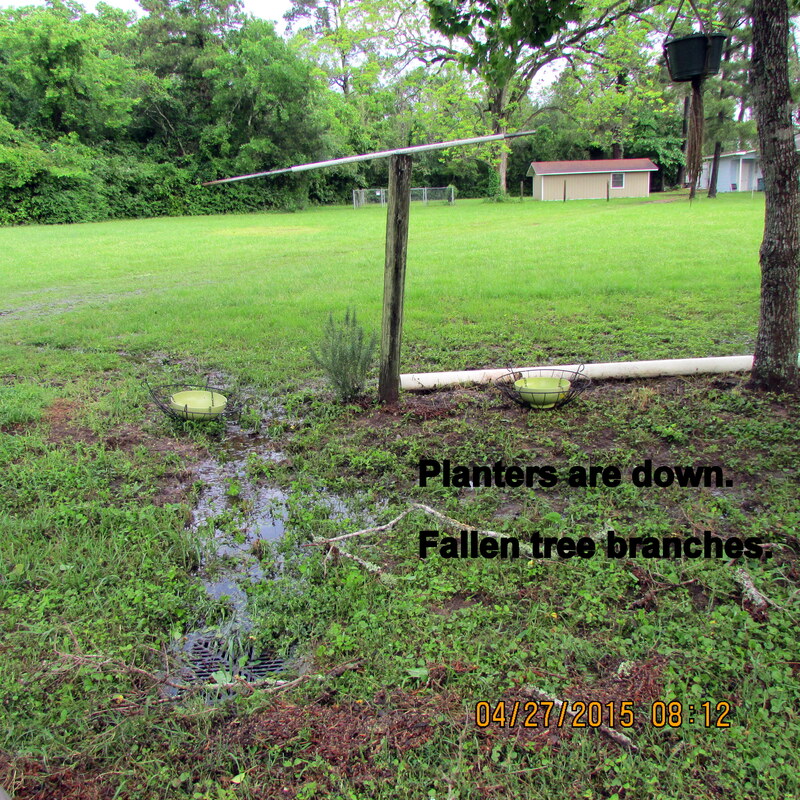 It was eight o’clock before power was restored to the entire area. 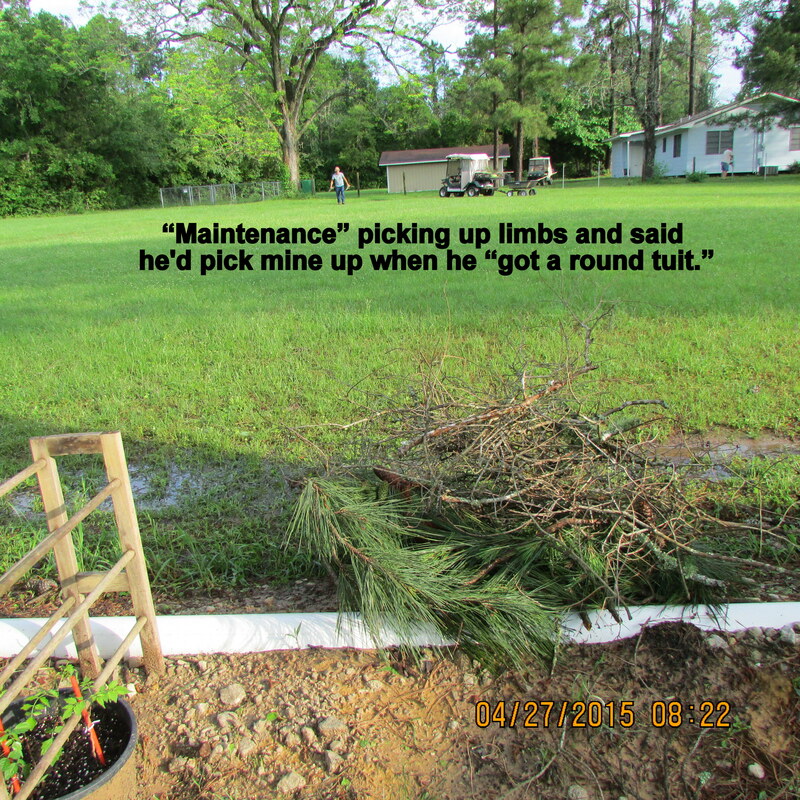 I headed home and started collecting debris in my yard. Nine-thirty as I type these words and it is a bright sunny morning. However, a second wave of thunderstorms will hit this afternoon. Humor me?! I want to display larger images of two pictures. Have you heard that old expression about making a silk purse from of a sow’s ear? I like to think that I’m creative and turn a piece of junk into an art object. Debatable?! 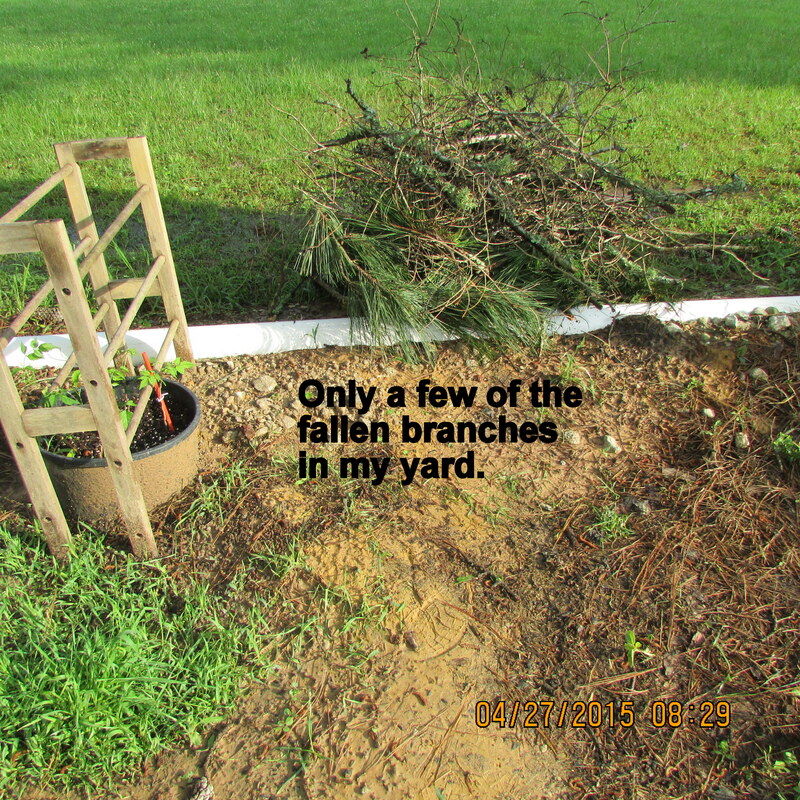 Remember the “masterpiece” I built in North Carolina? I’m still using it today. 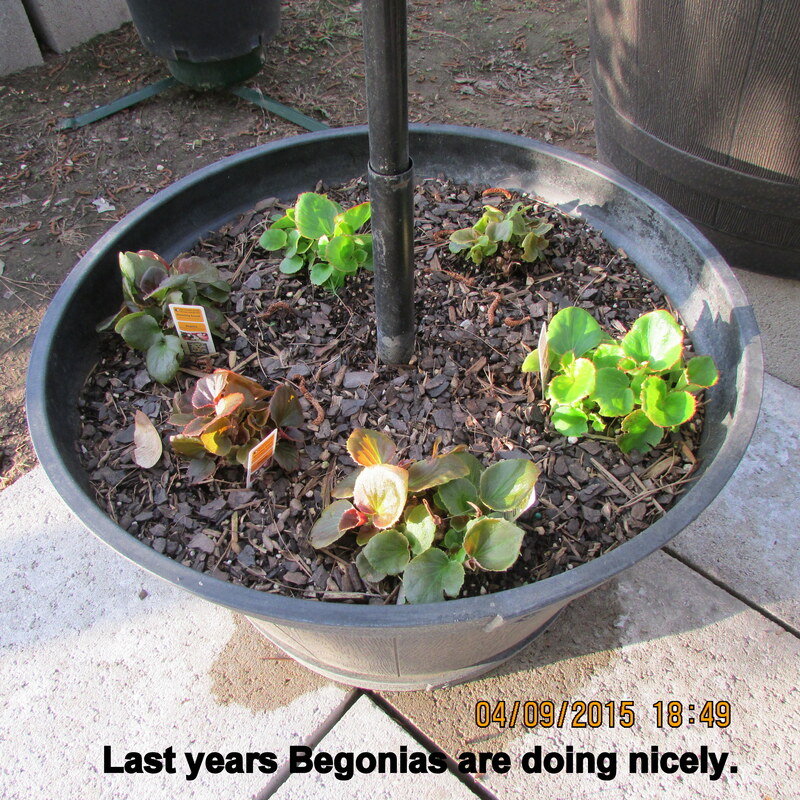 Here are last year’s Begonias in the planter base, and Petunias in hanging baskets. 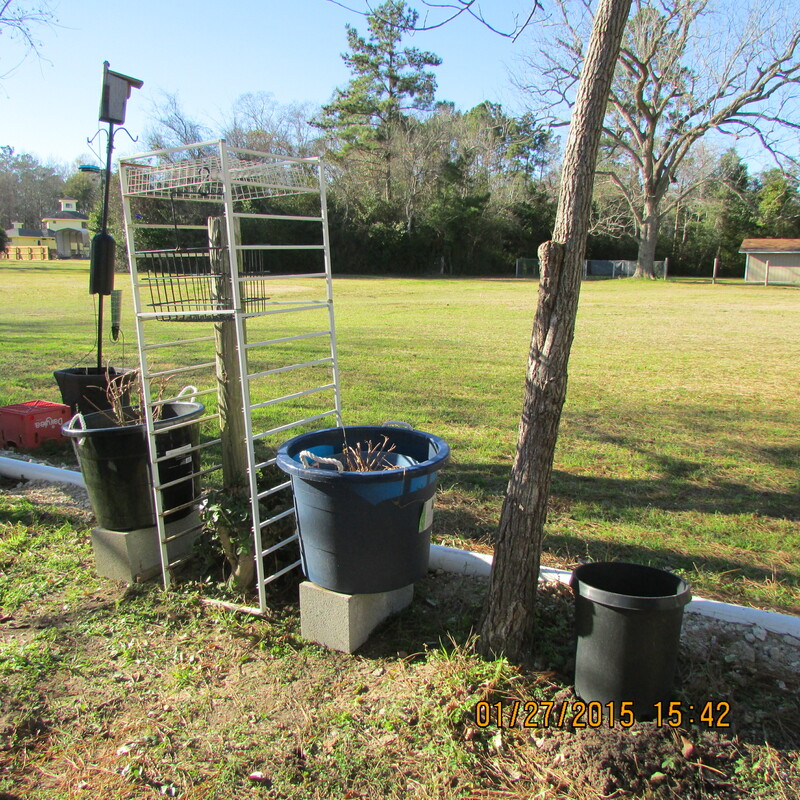 Well not an “art piece” but the use of “junk” for a trellis. 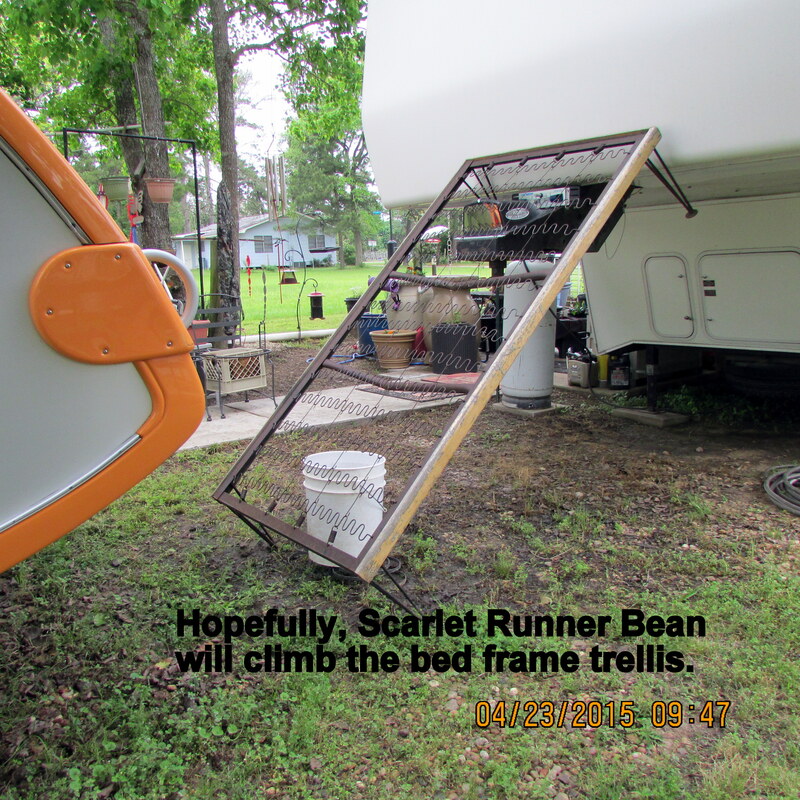 (Above left) See the twin-bed-frame leaning against the tree? 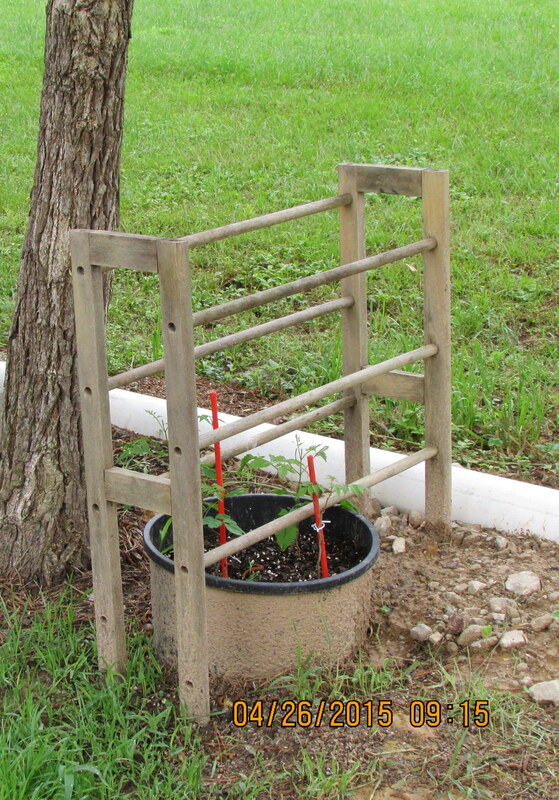 Now it will serve as a trellis for Scarlet Runner Beans. 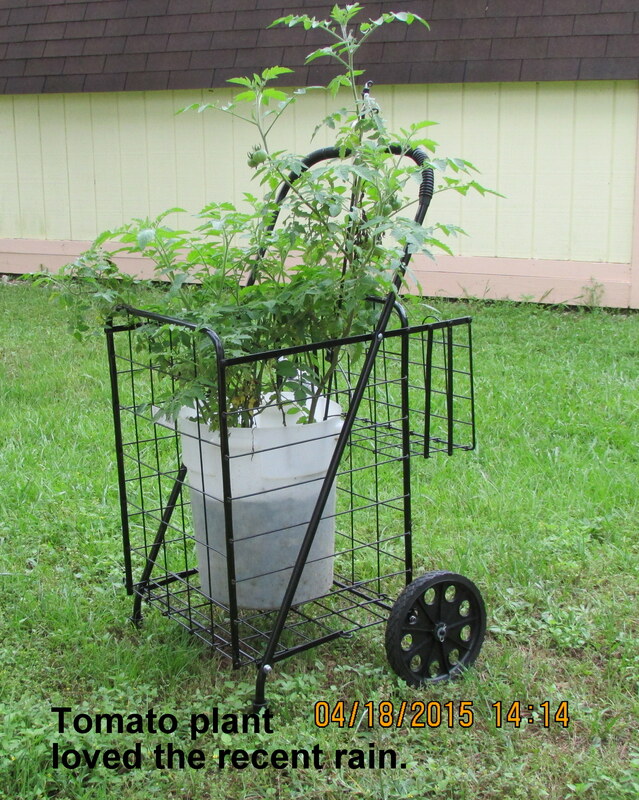 How about that cart as a trellis for “Tommy” tomato plant?? 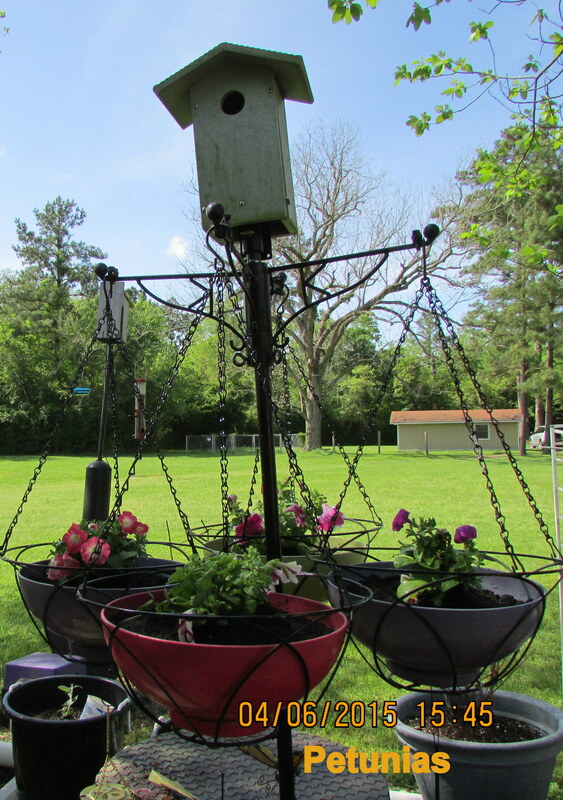 Now I can navigate the plant between sunshine and shade. 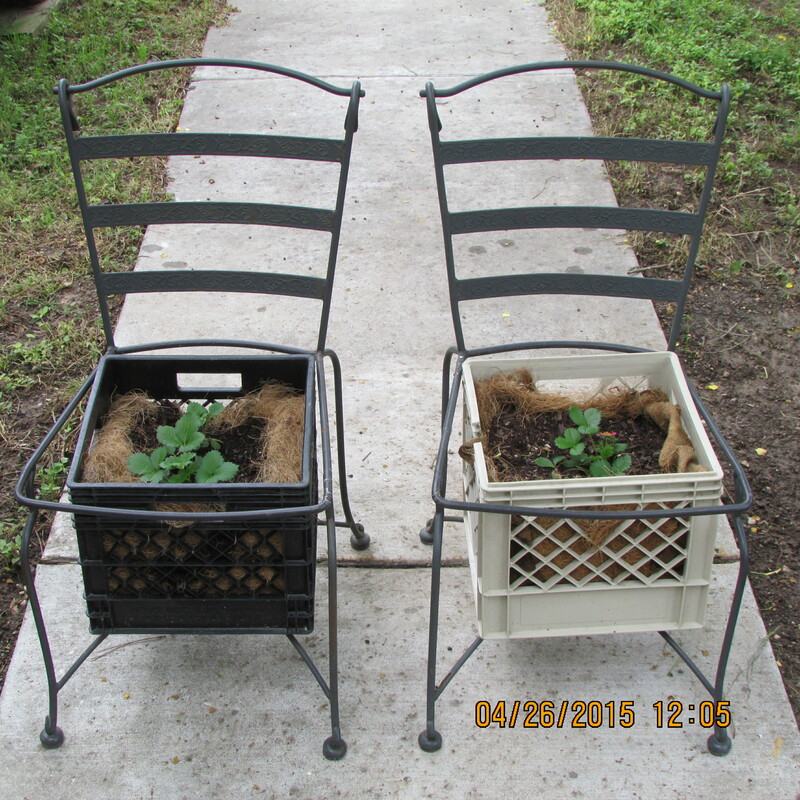 What about the milk crate planters on the wrought-iron chairs? It was an experiment but looks attractive (IMHO). 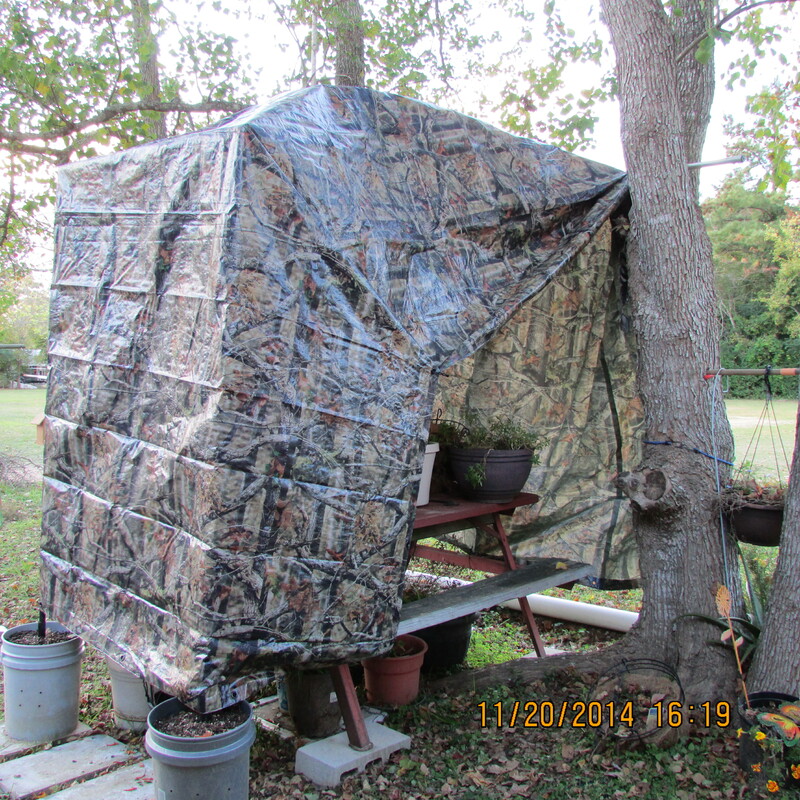 What do you think of the shelter I built to protect my perennial plants during the winter?